When looking through advertisements to find inspiration for my Parsons Challenge, I came across one that struck me right away. The advertisement for SunRay bananas read “Peel Open a Party”. Not only did this strike me because of my love for bananas, but because of what started flowing through my head when reading this quote. Relating it to the real world, I instantly started to think about the concept of stereotypes. Stereotyping is something that has been relevant for centuries. People make assumptions based off groups of people whether it be religion, sexual orientation, race, political preference, or other affiliations. However, it is certainly not the case that all of these people are the same. Every individual is different and holds their own uniqueness inside of them. Just like one cannot judge a book by its cover, nor can one assume those from a particular group are all the same. For my Parsons challenge, I wanted to express this idea while still keeping the inspiration from the advertisement clear. For my visual piece, I chose to use different mediums to impart this uniqueness to ordinary fruit. I took four bananas and peeled all of them open halfway. I then covered each one in a different material so that the edible part of the banana would no longer be visible. 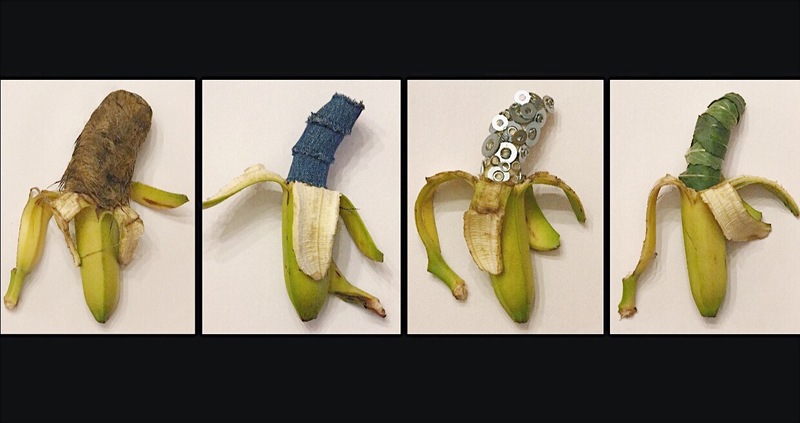 I covered each banana in one of these four materials: faux fur, denim, steel washers, and leaves. These covers are there to serve as an illusion that each banana is different and unique on the inside, while the banana peels serve as representation of them all being a part of the same group. Aside from them representing this message about stereotyping, they maintain the idea of “Peel open a party”. By peeling each of these bananas open, one would find a new, exclusive look. Hence, the differentiation of each lends itself to a dynamic “party” rich and lively with the excitement of meeting new people. Like many others I am a firm believer that art, no matter what form, should be something that makes the viewer think. There should always be a strong meaning behind a piece; viewers should be able to take something away from the piece that they can incorporate into their everyday lives. By creating this piece, I hope to send out a message against stereotyping people. No matter someone’s place in the world, a person should not have to deal with assumptions made by others who make judgements solely based on what they see on the outside. Breaking such stereotypes and taking initiative to explore beyond what one sees is an important part of beginning a life at Parsons. It is imperative students reach outside of their comfort zones to learn what exists apart from their own frames of reference. It is only in doing so that one can not only challenge preconceived stereotypes, but also grow past these boundaries to uncover the true wonder of each individual.